I am trying to export terrain block, which crashes ( very tall in spots) & I send report to CE as well. Does selecting a terrain 'area' grab all the 'height' or does one have to grab the entire terrain height ? tall terrain areas, or just is a bit buggy in CE 5.5 or such ( I know a lot is in the works, so just asking ). Have you updated your Engine to the latest version? If you are using GameSDK have you updated that to the latest version as well? What is your terrain max height? How big is your map? Are you exporting as trb? then exported as terrain block without any issues. Could you give us the exact reproduction steps? Sorry for late response, have been unavailable. If you mean Game SDK sample that can be downloaded, no atm I don't have enough ssd room- big sigh and hope to remedy Very soon . As seen here> https://docs.cryengine.com/pages/viewpa ... d=25535304, it doesn't give any hints on how to grab very high terrain areas so what is the trick to this ? I can get 'close', but when I do seemingly get into height, I can't get entire base area, only 3/4, see PIC attached. I made it too small ( was testing), so I'm trying to export so i can paste onto appropriately larger terrain. I'm having a really hard time grabbing all of it, any hints how you do it, or a video I've missed possibly ? Is the problem, that I do NOT have gamesdk then ? Its hard to move fwd when I'm stuck today where the engines is making it impossible to select needed terrain section. 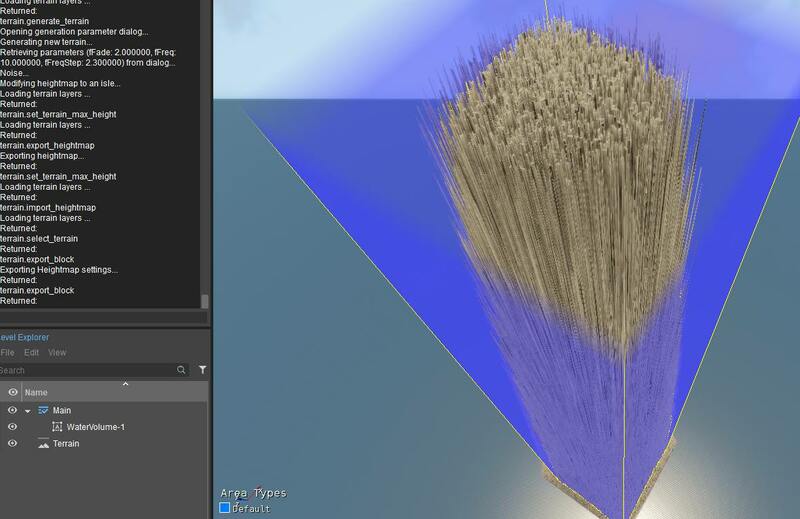 GameSDK is not required for terrain import/export. We cannot view your screenshot from our internal systems, we ask you find another image host provider to show us the problem you are having. Make sure you do not select outside of the terrain and you may need to select smaller chunks if the editor is crashing when exporting. Alternatively you can simply resize the terrain to a larger size, your original terrain should stay in the origin point. Sorry for the week it took to respond, need a better email app, windows 10 mail is insufficient (for me anyway, and you can't filter with it so I'm going totry something else). I'll upload it to onedrive I suppose and post back with url. HM yes you're right, I'm sorry I didn't think of that, Im SO USED to ue4 ( another project) whereby resizing causes my entire world to resize as well, I'm So glad cryengine doesn't do that!! I'll try both recommendations and get back to you very soon. I resized terrain, but once it was done (8192 sq everything else the same), it flattened out my terrain block. I've tried with firefox and chrome, I'm unable to place a image INLINE like other engine boards so that like you've done, the image is SHOWN on the forum not as a link ,Its not working with google drive OR onedrive to place a inline image, and there is no 'upload image' with which to upload any image.